This year, thanks to receiving ESPN America and excellent coverage on the internet via MLB I have finally got to understand the game of baseball. 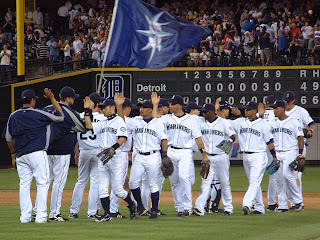 At the start of the season I picked a team to follow at random and went for the Seattle Mariners . A team that as I later found out , have never really done anything , being one of only two teams never to have reached a (over inflated ego style titled ) World Series. Following the games has been easy . The time difference means most are played whilst I sleep but a quick check on my phone every morning tells me all I need to know. The statistics give a comprehensive indication of how the game went ( more like cricket than football in that respect ) with video highlights of all the major incidents . Game by game the rules and tactics all started to make sense. Just like Southampton my football team always seem to do, they started the season badly. A good recovery saw them challenging for a play off place untill suddenly things went off the rails . Now 100 games into the 162 game season they are currently on an unwanted team equaling record of 14 defeats in a row . I'd imagine that they will be going into todays game with some trepidation. I'll follow the rest of the season with interest. The question is, having absolutely no connection with Seattle do I stick with them forever or pick a new team to follow next year. After all I entered their free ticket competition on Twitter explaining that I deserved 2 free tickets to a game because they were my newly adopted team in a new sport and a real life game would only help me appreciate them and the sport even more, but travel expenses would need to be included. I didn't win - maybe another team would appreciate my support a bit more.